Why should I invest in a service plan? Why is buying a service plan a good decision? Many people never realize their home heating and air conditioning system works roughly 3,000+ hours each year. To put this in perspective, if your automobile is driven for the identical 3,000 hours at over 60 miles per hour it would certainly travel 180,000 miles. Hardly anyone would contemplate this kind of trip without planning to get the car’s oil changed and lubricated, in addition to scheduling a tune-up. Your heating and air conditioning systems functions much more of the time than your automobile, and like your automobile, require scheduled tune-ups. At Boyle Energy we go above and beyond providing you the best energy services in the Philadelphia area. By taking advantage of our many services contact options, you will be sure to have peace of mind at all times. Service Plan members earn credits. 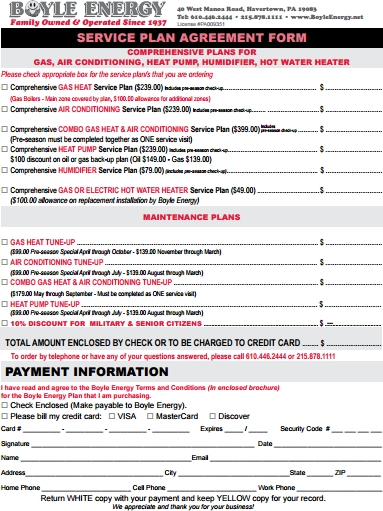 Boyle Energy rewards service agreements customers with loyalty credits. 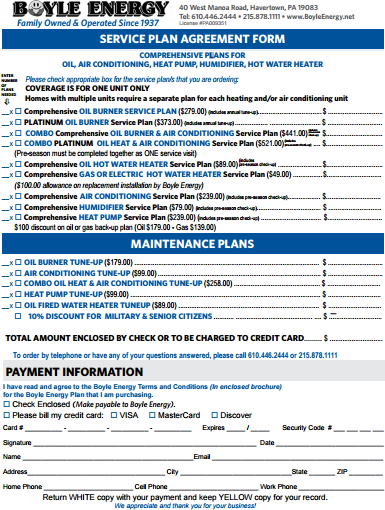 Each year that you maintain a service plan you will receive a $50 credit per year, up to a maximum of $500, which can be used towards upgrades and new installations. Contact our office to learn how to redeem these credits.